"Avengers: Infinity War" is now available for digital purchase and to celebrate we're giving away 10 free copies of "Avengers: Infinity War". All you have to do is follow us (@TheGeekTwins) and @VuduFans on Twitter. You can also tweet your favorite Avenger for an extra entry! This Friday, August 3 at 7 pm PT Vudu is hosting an incredible fan event. 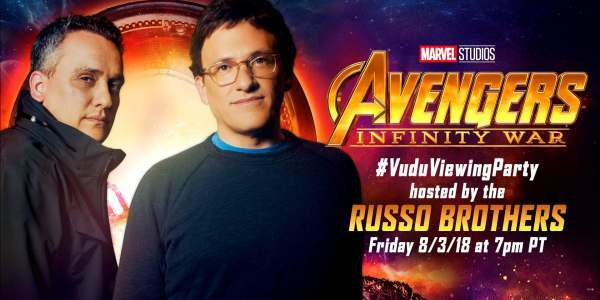 The #VuduViewingParty will be hosted by the "Avengers: Infinity War" directors Joe and Anthony Russo. It brings together fans from around the nation in a unique digital experience. Normally you can't talk during a movie, but during this fan event talking is encouraged! You can share reactions, fun facts, gifs and memes during the event. Not only will this event bring together fans from around the world but prizes will be given away! A 4K TV, autographed movie posters, Funko Pops, Marvel Legends action figures, replicas of Captain America’s shield, Thor’s hammer, Iron Man’s helmet, Thanos’ Infinity Gauntlet, and much much more! RSVP now to follow the event page on Facebook. Fans must RSVP to the Vudu Viewing Party through the event's official page. To stay updated on future Vudu Viewing Party events, follow @VuduFans on Twitter. You've pre-ordered the movie, you've done the #VuduViewingParty homework, and now your patience and preparedness are about to pay off. Marvel Studios' Avengers: Infinity War will soon be available to watch on #Vudu! You can watch Avengers: Infinity War in 4K + HDR on more devices with Vudu (supported devices) and Vudu supports Dolby Vision and HDR 10. 4K and HDR are supported for Apple TV. HDR delivers lifelike colors and a more vivid cinematic experience. So if you want to watch "Avengers: Infinity War" in a whole new way make sure you sign up and join the #VuduViewingParty! Are you going to watch "Avengers: Infinity War" this Friday!